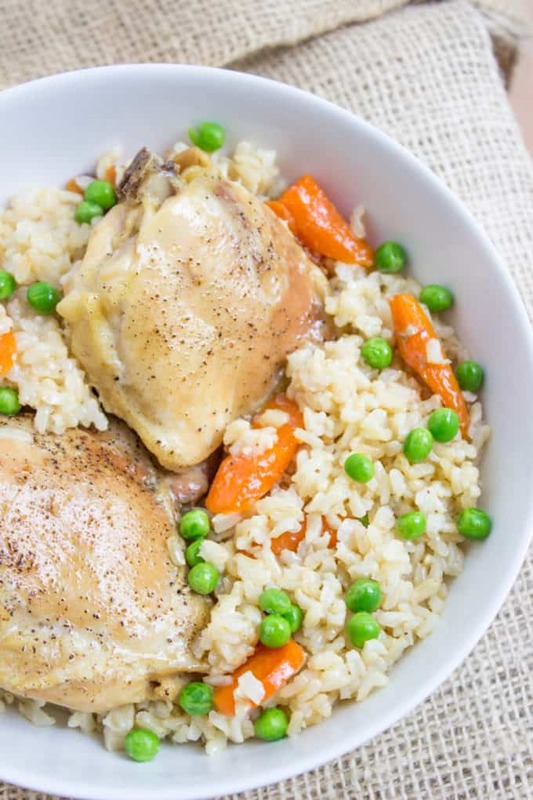 One Pan Baked Chicken and Rice Casserole, served with brown rice, carrots and peas, is healthy, flavorful and involves almost no clean-up! 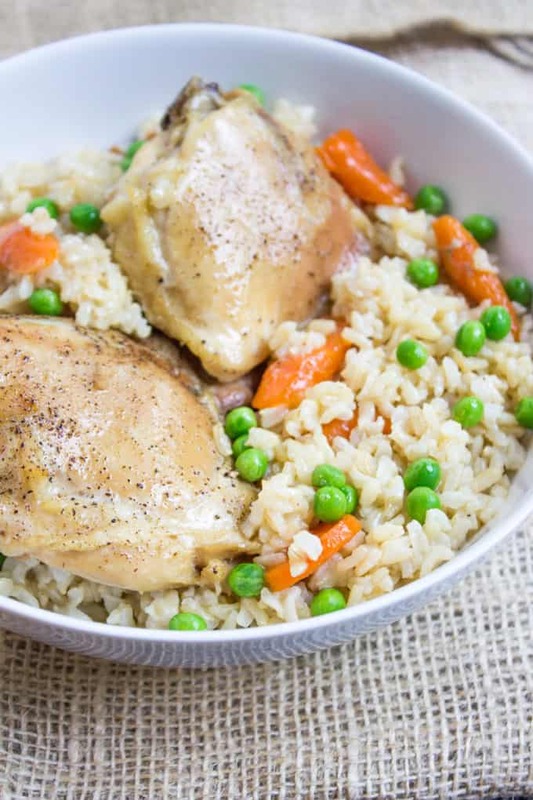 One Pan Chicken Brown Rice Vegetable Casserole recipe will delight you with its ease and quick cleanup anytime you are tired of cooking! I spent a weekend retesting, reshooting and double checking every bit of this chicken and brown rice recipe! 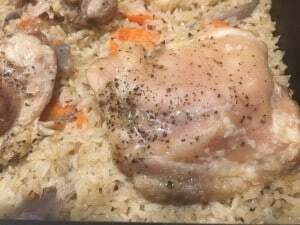 Chicken thighs baked in brown rice with chicken stock, butter and carrots bake up into a fluffy chicken and rice bake. Right when you take it out of the oven you pour on some frozen peas and mix. The heat of the dish will warm them without making them mushy. Dinner is prepped in 10 minutes, an hour in the oven and you have a healthy easy meal people will fight over! Want dinner on the table in 30 minutes? 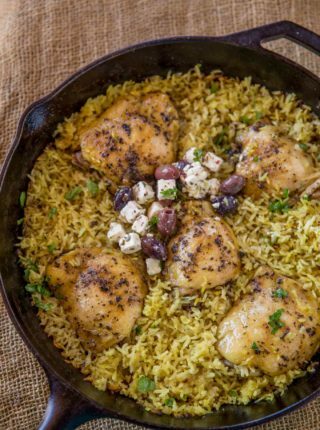 If you swap the brown rice for white rice in this chicken and rice casserole, the meal will be done in 30. The meat won’t be quite as soft and tender, but it will still be delicious! 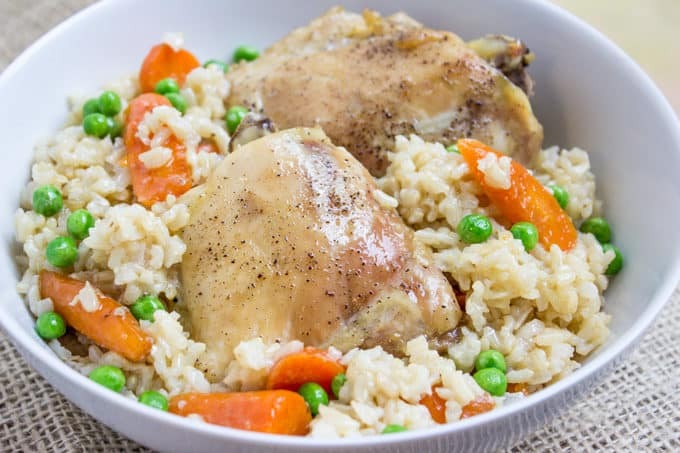 Then I decided to test this baked chicken and rice recipe a couple of more times because with 3 of you saying the same thing I knew there was a disconnect between what I was seeing/tasting and what you all were experiencing and I knew it was more than a five-minute difference. I use 3-4 ounce skinless thighs (this time in July 2016 I used 4-ounce bone-in skinless thighs). I realized this may have been the biggest issue that may have presented itself. When I went to the store and bought some more chicken I got some of the normal chicken thighs that were on sale, both bone-in and boneless. The boneless ones were almost 6 ounces each, bone in was closer to 7. Second, I noticed that between my normal chicken and the larger thighs that they seemed slightly frozen in the middle. I don’t know if anyone else’s chicken was like this, but that may also add to the timing issues. If they are at all frozen it just means it will take even longer since the colder the chicken is it will just make the boiling stock get cold quickly which will also add to the cooking time. I know no one mentioned this but I think it’s worth mentioning if you peel back the foil to take a peek during cooking you are letting all the steam out which will make the cooking time go way up. This is totally not meant to insinuate anything but I would also just test the temp of your oven. I have a thermometer that lives in there so I know my oven is pretty spot on but you never know. Final note: The biggest difference in your cooking time will be the temperature of your chicken and the temperature of your water. If your chicken is fully defrosted and you use boiling hot water/stock and you wrap tightly with foil, you should have a fully cooked, non soupy meal in 65 minutes. If you guys have any other notes, I am happy to answer in any way I can. I didn’t realize how much larger the chicken in the store would be! My apologies to those who had fails, I wish I could deliver you a tray of this Chicken and Rice Casserole cooked through, I made four trays of it in the last three days determined to get to the bottom of this… (Thank goodness this dish freezes well!). 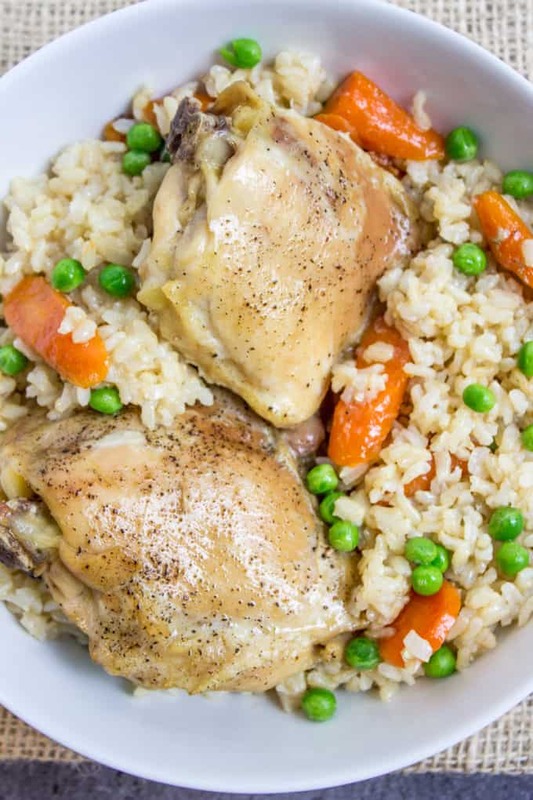 One Pan Baked Chicken Brown Rice Vegetable Casserole, served with Carrots and Peas, is healthy, flavorful and involves almost no clean-up! Scatter rice on the bottom of the pan. Season the whole pan generously with salt and pepper. Remember this will be seasoning the whole dish, not just the chicken. 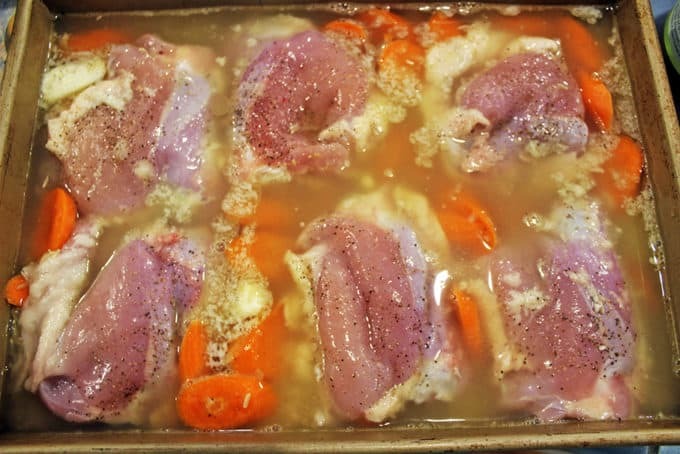 Scatter the carrots between the chicken pieces. Pour the boiling hot stock on top gently. Cook for 65 minutes (If your chicken pieces are larger please refer to the notes for updated cooking times). Right when coming out of the oven, toss with frozen peas. Adapted from Diethood. Which, by the way, is a totally awesome blog you should check out! I use 4 ounce skinless thighs. I realized this may have been the biggest issue that may have presented itself. When I went to the store and bought some more chicken I got some of the normal chicken thighs that were on sale, both bone in and boneless. The boneless ones were almost 6 ounces each, bone in was closer to 7. Second, I noticed that between my normal chicken and the larger thighs that they seemed slightly frozen in the middle. I don't know if anyone else's chicken was like this, but that may also add to the timing issues. If they are at all frozen it just means it will take even longer since the colder the chicken is it will just make the boiling stock get cold quickly which will also add to cooking time. I know no one mentioned this but I think it's worth mentioning, if you peel back the foil to take a peek during cooking you are letting all the steam out which will make the cooking time go way up. Psssst… want to hear a little secret? 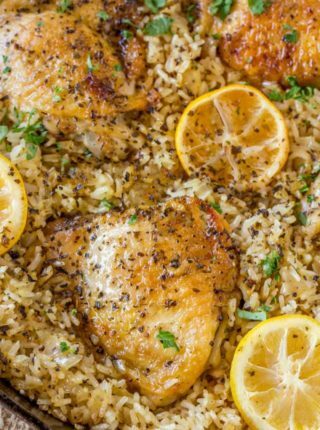 This One Pan Chicken and Rice Casserole recipe is one of 10 in my FREE e-book 5-10-30: 5 Cuisines, 10 Full Meals and 30 Total Ingredients that is a bonus for email subscribers only! It includes shopping lists that set you up for two weeks of weeknight dinners with no ingredient waste and tips for cooking and alternate ingredient options. If you haven’t subscribed for updates you may want to now and get the e-cookbook FREE! Can this be Cooke with chicken breasts rather than thighs? Would the cooking time then vary?? You’ll end up having to make everything separate because the chicken breasts wouldn’t take as long to cook. Sorry. Hi can you use white rice instead? If so, what would be the directions for cooking it?? Yes, you can use white rice instead. It’ll take about half the cooking time though your chicken might not be as tender since it’s not cooked as long. It’s still really good. Enjoy! Now, this is what I’d call a perfect recipe—common ingredients, quick to prepare, one pan meal and delicious! I made this tonight and even though I forgot to add the peas, it was soooo good. Thanks for sharing. This dish is fantastic! I have made it at least half dozen times already. Kids are grown, so it’s just my husband and I, so I cut the recipe in half. 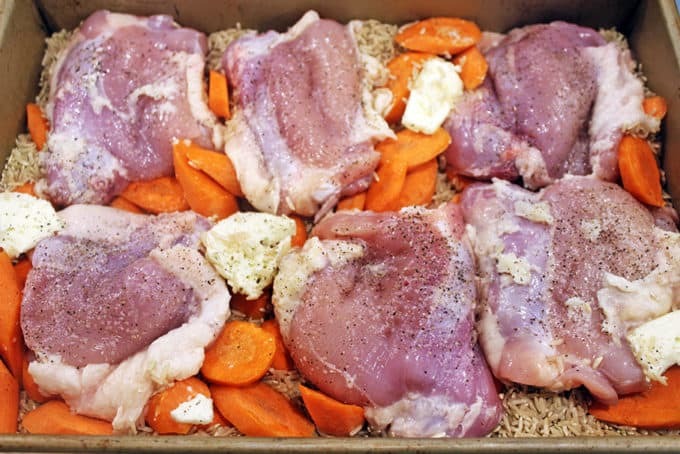 I use chicken thighs as suggested, carrots, and I buy the box of Uncle Ben’s long grain wild rice, the slow cooking kind, not quick cooking. I use the flavor packet from the rice and mix it with the boiling chicken stock. My husband requests this often and it’s a plus for me because it’s so quick, no pots and pans to wash, Just my little covered roaster. Thank you for all your great recipes, you never fail me! Hi, I followed the recipe and don’t know what happened. My rice stayed hard. Any suggestions? Where might I have gone wrong? Oh no! Next time, you’ll want to make sure you’re using boiling hot water/stock and make sure that it’s wrapped tightly with foil. It’ll help keep the heat in and cook it. Hope this helps. Have you tried this with drumsticks? 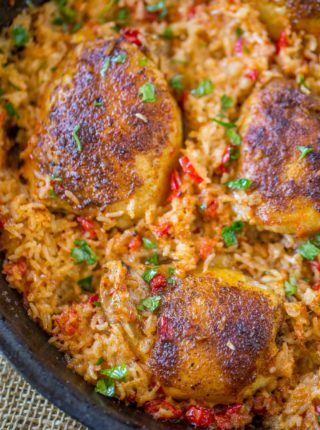 I don’t think I would recommend it because the rice needs more cooking time than the drumsticks would because there’s less meat on them than thighs. If you decide to try, I’d love to know how it turns out. Thanks! 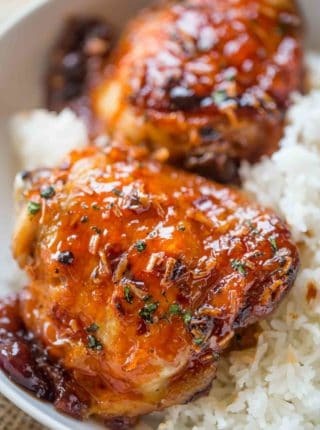 So I am desperately wanting to make this but only eat chicken breast and am trying to stay away from white rice. I was thinking what if I cook the chicken with seasonings/veggies in oven and cooked brown rice in rice cooker and then combined them for the last 5 minutes? Not all in one pot, but….. maybe???? What are your thoughts? If you’re making them all separate, I would think you should just combine them all on your plate to get as close to the original as you can with the substitutions. Enjoy! So glad you enjoyed it! I used plain organic long grain brown rice for this recipe. This is very easy to make. Haven’t ate it yet but the recipe calls for 2 lbs of sliced carrots. Is that incorrect as that is a lot of carrot? I am thinking of making this but before I do, I read how some people have issues with the timing… what may be one of the problems is the type of brown rice used. It makes a big difference. So many types of rice now, which is nice but you have to pay attention to the different cooking times of each type of rice and water absorption. 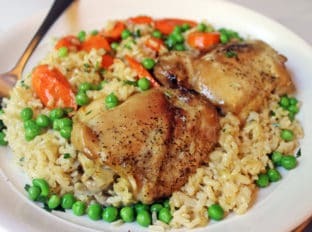 I loved the baked chicken brown rice veggie casserole. We take dinners to people in our church for certain occasions and I’ve taken this twice to two different families and they have loved it. I also have made a smaller amount for just my husband and also for company! Thank you! Made this in the crockpot and it turned out great!